The suicide of a Dalit PhD student at Hyderabad Central University in mid January has shone a nasty spotlight on the social and economic exclusion still produced by India’s caste system. 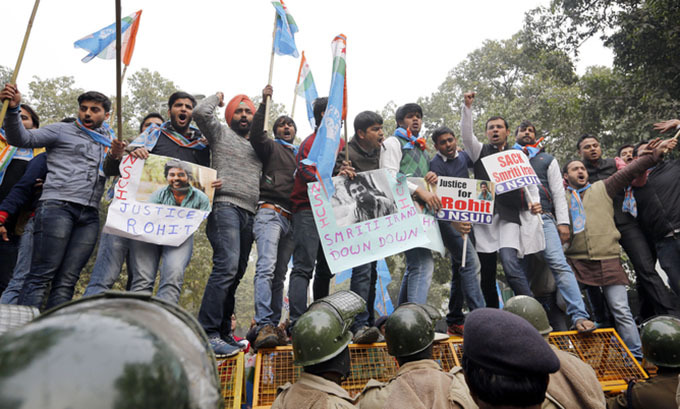 Rohith Vemula killed himself after being expelled from the university following a complaint made by one of the leaders of India’s ruling Bharatiya Jananta Party (BJP). Along with four other Dalit students, Vemula was protesting against the capital sentence given to a suspected terrorist, which angered the BJP. The Ambedkar Student Association he belonged to got into an altercation with the Akhil Bharatiya Vidyarthi Parishad student wing of the BJP. Vemula and the other four students were suspended by university authorities in August 2015. Vemula and his friends continued their protest, but their fellowships were discontinued and they were subjected to social ostracism. His suicide sparked protests from student unions against the treatment of Dalit students at Indian universities. 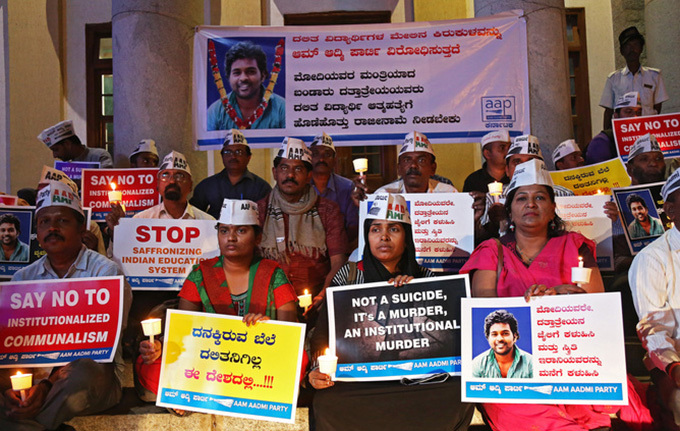 The galvanising force has been a statement in Vemula’s suicide note – “My birth is my fatal accident” – drawing attention to the status of many other rural Dalit students. The university administration has changed its stance since Vemula’s death and has admitted the four other students back into the university. Dalits form a quarter of India’s population, belonging to various religious communities and sub caste groups. They occupy the lowest social status in Indian society due to their birth as “untouchables” and are considered to be socially and religiously polluting. They are outside the rigid caste system that strictly orders and governs Indian society. Higher education and successful employment among Dalit populations remain a distant dream in India. High levels of school dropout, compounded by a lack of accessibility and the denial of opportunities, means that students from Dalit backgrounds have to depend on the benefits offered by the state, such as the reservation policy, which provides ring-fenced opportunities to individuals from socially excluded communities. Yet students who come through the reservation system are seen as less intelligent by upper caste students who object to the meddling with the “meritocracy” of higher educational institutions. The opponents of reservation policy are worried that by accommodating Dalit students, academic standards will be compromised. Vemula’s death has once again exposed the deep-seated caste discrimination in higher education institutions – both among students and teachers. In similar higher education institutions in India, there have been 23 deaths of students from Dalit backgrounds. Educational institutions that are supposed to be centres of excellence and social transformation instead perpetuate social segregation and caste-based discrimination. Education has now become a disciplining enterprise working against Dalit students: they are constantly under threat of rustication, expulsion, defamation, discontinuation. In a society where students have waged massive struggles to ensure their right to access higher educational institutions through the protective, enabling concept of the reservation policy, no one has dared to shed light on how many of these students are allowed to leave these institutions with degrees, how many become dropouts, become permanent victims of depression, how many end up dead. The fallout of Vemula’s death has lead to political parties pointing fingers to blame each other for their anti-Dalit activities. Once Vemula’s death caught the national attention and students began mobilising, the politicians were quick to extend their support and politicise the entire episode. This is a very familiar pattern of response from the politicians to the daily occurrence of Dalit discrimination. What this politicking exposes is the vulnerable state of Dalits who are aspiring to change their lives. The reservation policy has had little effect on the empowerment of Dalits through the national educational system due to prevailing discriminatory caste practises. The higher educational institutions are still a preserve of upper caste communities. It is very unfortunate that certain sections of Indian society tried to underplay the significance of Vemula’s suicide on social media, revealing the dark side of caste prejudice. The right-wing politicians now in charge of India have failed to deliver the promises of Dalit upliftment made during their election campaign and continue to perpetuate a casteist worldview and push for a homogenised Hindu society. When aspirational students from Dalit communities do strive to break into the competitive educational system, they are squeezed out through violent caste discrimination. What we are seeing on display across India is a grotesque mutation of caste prejudice, that is pushing some of the most exploited to take their own lives. But the tenacity and resilience of Dalit communities cannot be underestimated. There couldn’t be a more opportune time to realise the message of visionary Dalit leader Ambedkar, who called upon Dalits to educate, agitate and organise.